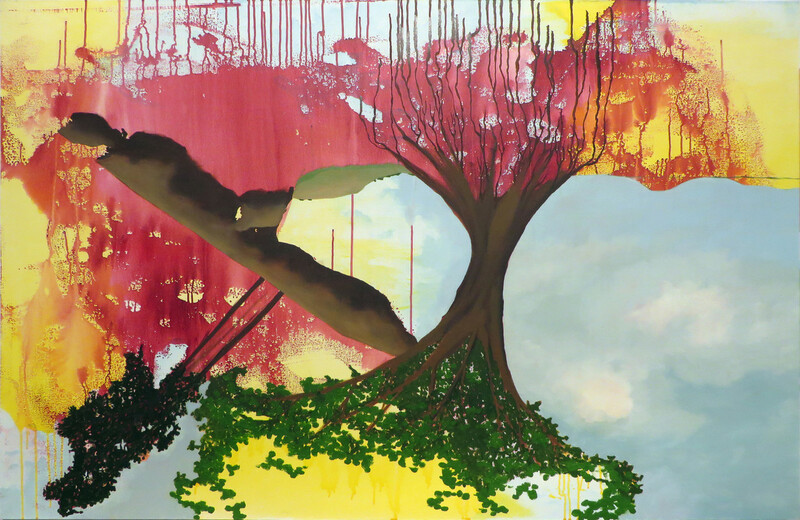 The “Loss of Promise” series of paintings depict an upheaval of the serene, or even sublime landscape, allowing bright, cheerful colors to belie the volatile contents of near or post apocalyptic scenes. Trees are uprooted, falling from the sky, land is flooded, structure obliterated, luscious landscape ruptured by swaths of gestural color. These paintings have their source in the observed forces of nature and natural disasters. The balance between the forces of destruction/violence and rebirth/beauty is not necessarily cyclical, but somehow coexists in turbulence and harmony within these paintings, creating a world that is sometimes surreal, both static and explosive. Donnelly draws upon Eastern and Western traditions of landscape painting as she deconstructs observed images, objects, and ideas while combining these with the imagined possibilities of their reconstitution.